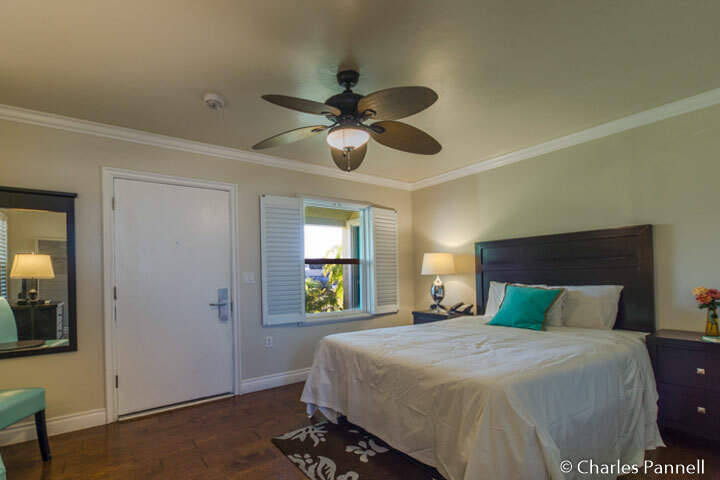 Tucked away in a quiet coastal neighborhood, the Beach Bungalow Inn and Suites (www.morrobaybeachbungalow.com ) is a quintessential Morro Bay property. Like the sleepy little California fishing village, this retro motel takes visitors back to a simpler time. The 1940s motorcourt was renovated in 2010; and although the rooms were enlarged and modern amenities were added, it still exudes the charm of yesteryear. Best of all, this 12-room inn now boasts a very spacious wheelchair-accessible room. Although there are steps up to the small office, there’s also ramp access on the left side. The accessible Snowy Plover room is located directly across the parking lot from the office, with accessible covered parking next to the room, and level access to the front door. Inside there’s good pathway access over the laminate and tile floors, and plenty of room to maneuver a wheelchair. The bedroom is furnished with a 26-inch high queen-sized bed with wheelchair access on both sides, two chairs and a table, and a chest of drawers. Decorated in a palette of sea tones, and accented with white wooden shutters and a wicker Bahamian ceiling fan, the room exudes a definite seaside ambiance. 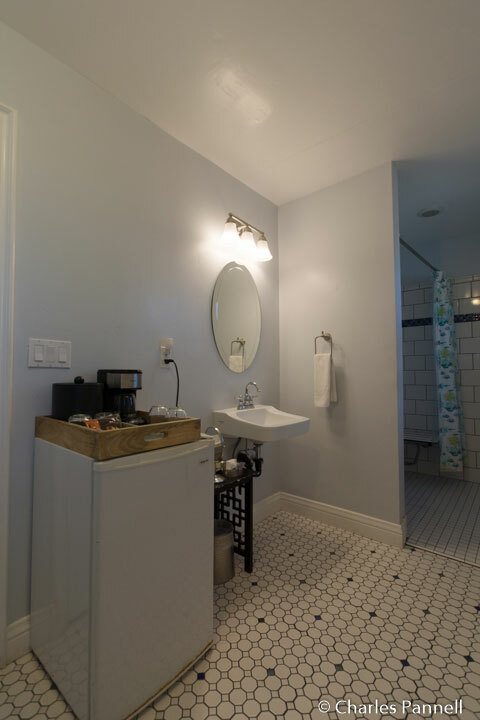 The oversized bathroom is very nicely done, and it includes an ample five-foot turning radius. 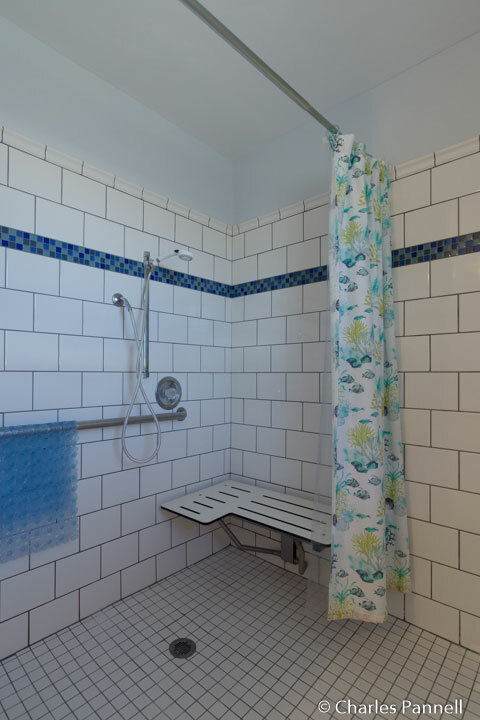 It’s equipped with a tiled roll-in shower with grab bars, a hand-held showerhead and a fold-down shower bench. 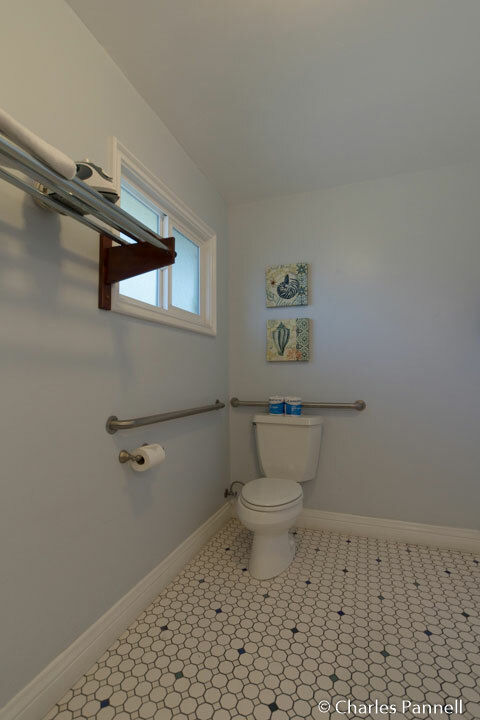 The toilet grab bars are located on the back and right walls (as seated), and there is also a roll-under sink in the bathroom. Top it off with a refrigerator and a coffee maker, and you have a very comfortable room. A made-to-order breakfast — delivered to your room — is also included in the nightly rate. Owner John Patel is quick to point out that he uses locally sourced organic ingredients whenever possible, even in the home made muesli. 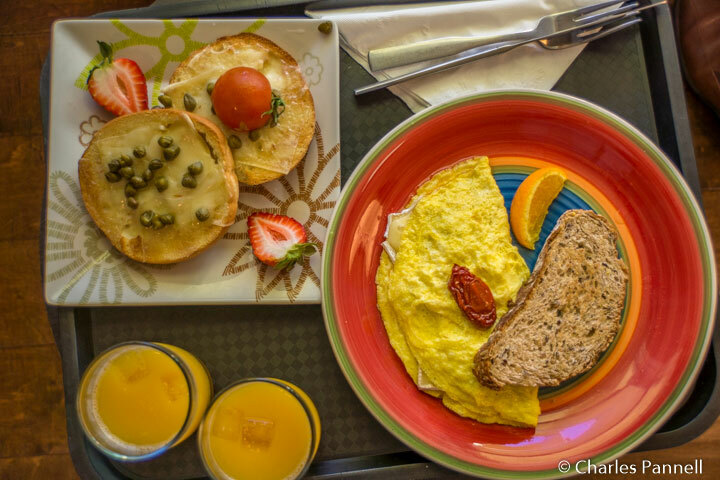 Breakfast choices range from omelettes, made-to-order eggs, bagels with salmon or melted cheese and tomatoes, and waffles with a variety of tasty toppings. And then of course there’s the fresh squeezed orange juice, complete with pulp. It’s definitely a step up from your average hotel breakfast. And you just can’t beat the location of this family-owned property, as it’s only a few blocks from the Embarcadero and only a mile from Morro Bay State Park. Add in a nice view of iconic Morro Rock and the distant drone of a foghorn; and the Beach Bungalow Inn & Suites has all the ingredients for a very accessible and low-key Central California coastal getaway.